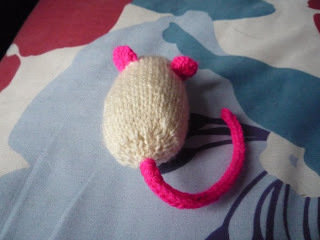 Today I decided to make a mouse, for no other reason than I just wanted one!! He's started off with an i-chord for a tail with the most amazingly pink wool I have ever seen; knitting with it nearly made my eyes bleed! B&T tightly Break off yarn leaving a long end for sewing up later, thread it through the stitches on the needle, pull to gather tightly and fasten off. 3mm DPNs for knitting the i-chord. 1 Pair of 7.5mm eyes. 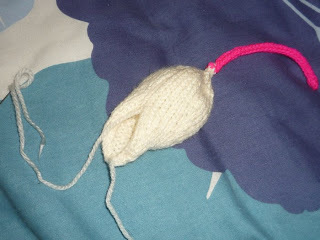 Knit an I-chord for the length of tail you’d like; mine is 5 inches long. Once you are happy, add your remaining stuffing and close up mousey. How he survived this one I'll never know!! Break yarn, leaving a long end. Thread this end through the stitches on needle, draw up tightly and fasten off. 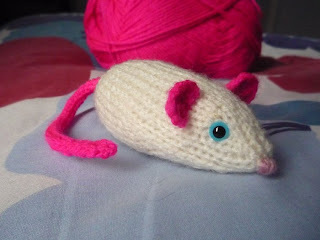 Place the ears where you'd like them on the mouse, mine are placed 3 rows behind the eyes, but it's up to you; move them about until you get the face you like :-) Once you are happy, sew them down. Super! 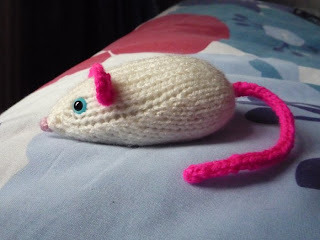 - All he needs now is a little nose so he can find the cheese, I used a lighter pink wool than the ears and just sewed up and down to create a little nose. And there you have it! One super-sweet, super-cute mousey! This is super cute (found it on Ravelry). My four year old son has just demanded I make it for him. I also found this on Ravelry-- and immediately cast on to make one for my old roommate. Just wait 'til I tell her there's a mouse in her room! ...She'll be so excited to have a pet, she might be disappointed when it isn't alive... At least he's cute. And mine has a purple tail and ears because I have no pink. Oh no, mousey is sitting in the box of FOs waiting for more yarn ends to be stuffed with. 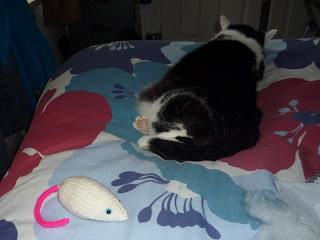 He was easy and enjoyable, except the yarn kept snagging on the needles, it was so humid. I just found this recently and wanted to let you know that it's the first pattern I've been able to semi-follow (Though I changed it up a little), because you made it SUPER easy AND super easy to follow! Thank you! 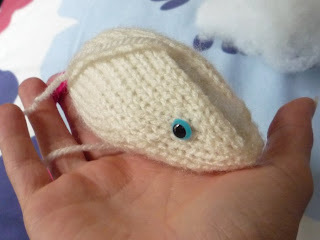 This is a wonderful mouse pattern! I've been looking online today and there's so many mouse duds out there! Sweet. Thank you. Two questions. (1) Is the increase used here "knit into front and back of a stitch"? and (2) If you start knitting after making the icord tail and end at the opposite side, leaving a long tail to sew it up, then how can you start the mattress stitch to sew it from the tail side if the yarn from the B&T is at the opposite end? If I get that answered, I can make a bunch of these. I’m just learning about I-cord. I have using it on a huge shawl, no problem. 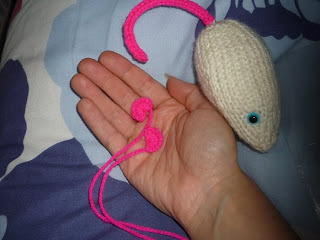 But I have no idea how to mak a mouse tail! Can you point me to an on line video, please!